Street foods are very famous in all part of India. No-one can deny the delicious street food from every corner of India. In Bengal, there are countless street food like Eggroll, Chowmein, Fuchkay, Fish Fry, Aloo Kabli, Chaat and many more. Among all, one of the famous Kolkata street food is Ghugni Chaat. The Masala Route here presents this Dries Yellow Peas Curry or Ghugni recipe that you can easily make at home. 1. Take a Pressure Cooker and add soaked yellow peas, water and salt and pressure cook it on medium heat up to 2 whistles. Now, turn of the heat and place the cooker under cold running water. Open the lid of the cooker and keep it aside. 2. Heat oil in a pan and fry the potatoes. Keep it aside. 3. Heat oil in the same pan and add bay leaf and cumin seeds. When a cumin seed crackles, add chopped onion to the pan and fry it until the onions are soft and light brown in colour. 4. Now, add ginger garlic paste and salt and again cook for another 1-2 minutes. Make a paste of cumin powder, red chili powder, turmeric powder with 2 tsp of water. Add the spice mixture and fry for few seconds till the oil comes out from the mixture. 5. Now, add chopped tomatoes and sprinkle some water. Cover the pan with lid and lower the heat. Cook the tomatoes until the raw flavour gone. 6. Just after 1-2 mins open the lid and stir the Masala. Now, add the fried potatoes and boiled dried yellow peas and toss with the masalas. Add ½ cup warm water to it and let it cook for another 5 minutes. 7. After 4-5 minutes sprinkle some Garam Masala powder on the curry and stir it. Turn of the heat and let the curry cool. Your Ghugni is now ready. 8. Now, it’s time to make the street food Ghugni Chaat. Taka e bowl of Hot Ghugni. Add lemon juices and sweet tamarind chutney. On top add chopped onion, cucumber, coriander leaves, black salt and Haldiram bhuji and enjoy this spicy tangy “Ghugni Chaat”. 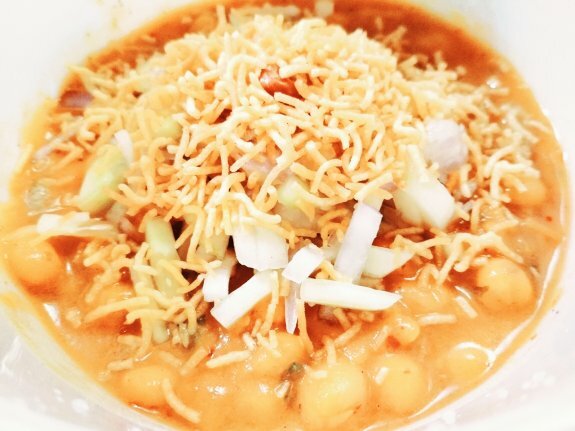 Have this Bengali street food “Ghugni Chaat” hot.